Gilels material, much of it from ex-Melodiya 78s, continues to pour out. Brilliant�s boxes offer good value and companies such as Doremi usefully augment standard issues from larger concerns. Now we have the cut-price blandishments � no notes, no attribution, no nothing � of Andromeda. All of this material has been out before; the first disc of the three has already appeared, note for note, on Doremi�s Gilels Legacy Volume 1. The Brahms Quartet with members of the Beethoven Quartet has appeared on volume four of the same series and the 1951 Florence recital is on volume five. I make no other comment except to note that those who are following Doremi�s series should view this three CD box set with a certain amount of froideur. The performances however are pretty much all up to the Gilels gold standard, even if other, later performances may be superior, in terms either of recording quality of drama. That said, the Beethoven C minor with the accompanist par excellence Kondrashin is, but for the boxy 1940s Melodiya sound, a real winner. Less well remembered than later traversals � Szell I suppose most prominently � this features flexibly imaginative conducting, Gilels� animating left hand and a commanding sweep amongst other virtues. The first movement cadenza is superlative and the slow movement is fluid and yet vitally expressive. The finale is buoyant and graced with imaginative rhythmic incident � altogether a fine performance. 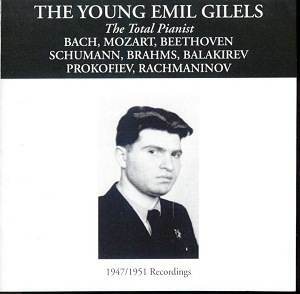 The Bach is an unusual feature of Gilels�s discography; he did play Bach, though not as much as one would have wished and he wasn�t associated with the repertoire in that way that Feinberg was. Still, the Brandenburg No.5 with flautist Kharkovsky from 1948 is, despite muddied textures - not Kondrashin�s fault - full of undeniable pianistic authority. The Largo is genuinely expressive, in the finest Russian Bach tradition, and this is a particularly impressive document that those who are familiar with the recordings of the late 1950s and onwards may not know. The 1948 Schumann sonata is not the same as the later one in the Brilliant box but it demonstrates once more how attuned Gilels was to the structural ramifications of Schumann�s sonatas. He unveils its complex mechanics with rare sagacity, the Aria unfolding with compelling eloquence and feeling. Every tempo he takes sounds right and his tonal nuances are, as ever, of the highest point of perception. Coupled with it is a collaborative effort with members of the august Beethoven Quartet, their first recording together; they were to re-record it in 1959. Additionally Gilels was taped with the Amadeus in 1970. Back in the late 1940s we find Gilels and the Beethoven were not as pointed or as assertive as the almost contemporaneous Budapest/Balsam performance given live in the Library of Congress. Almost all the eight players were Russian � only Balsam wasn�t � but the approaches are very different, with Gilels and the Beethoven talking a more emollient, mellower approach to dynamics and to attacks. The hymnal slow movement is more reserved in Moscow than the sonorous projection in Washington. The final disc is a live one and in rather shallow sound. Gilels� mahogany tone burnishes the Mozart sonata with an especially forthcoming slow movement. The Appassionata is best known from his 1973 DG recording but there are other performances naturally, a number live. His playing is vibrant, dramatic - a few dropped notes acknowledged - and in many places, simply torrential. The outer two movements are electrifying in their immediacy whilst the Andante is commensurately intense. Of the Prokofiev sonata one should note the formal mastery Gilels brings to bear � his incision in the scherzo no less than the sense of space generated in the slow movement. The playing throughout is sovereign but given concerns about provenance you will need to view this set with some caution.